Always Hungry? What’s in the pantry? I don’t do meal planning well…I don’t like to do meal planning. I’d much rather be spontaneous about my cooking and eating. Okay, I’m a picky eater–my appetite varies with the weather, the season, and even mood. While I’m managing to be moderately successful with the Always Hungry? meal plans, I really appreciate the “how to” section for each phase. It gives me much more freedom to cook what I want to eat. Even so, I’m looking forward to getting past the first two weeks of Phase 2 when I can do even more improvisation. Besides weight loss, one benefit of reading the book and starting this has been a close look in the pantry. In my pantry inventory, I found very few items that were on the discard list so doing without a lot of the prepared or processed things was not really a big issue. I’m fortunate that from where I live it’s easy for me to stop at the grocery store on my way to and from other errands, so I tend to shop for perishable several times a week–check out the market and see what looks good: meal planning on my feet. There is a farmers’ market close to me that is open on Wednesday evenings and one on Saturday mornings. Many times I cook without a recipe and improvise something from what is in the house; improvisation is much easier if you have a well-stocked kitchen and pantry.My only purchase that was specific for the Always Hungry meal plan was the whey protein. That may remain in my pantry after Phase 2 is over–shakes for breakfast work well for me since I really don’t want major food first thing in the morning. The Stahlbush Island Farms frozen berries have been a huge help with these when fresh berries aren’t of best quality. There are a number of things that I almost always have around. You can find lots of lists in cookbooks for things you “should” always have on hand, but all of those lists need to be modified to suit your tastes. If you hate anchovies, then there is not much point in having those in the pantry. I may not want to eat them on a sandwich, but they can add a very subtle, rich background flavor to vegetables like broccoli–used in very small quantities they won’t scream “fishy” at you, and they can stand in for nam pla in providing umami. Though I do shop for perishables frequently, I want to be able to prepare a meal even if it’s so hot that I just cannot face going outside, so I keep a reasonably well-stocked freezer, refrigerator, and pantry. Even just from the canned (not many things) and dried goods, I could produce a meal at the drop of a hat. Canned tomatoes in several forms–diced, whole, fire-roasted (add a little smoky flavor to a dish) and quick sauces–are such a pantry staple that they need not get more than a passing mention. Sun-dried tomatoes, a tube of tomato paste, capers, and roasted red peppers are some other things that get frequent use. Some of these supplies also stand in for the emergency kit in case of hurricane or ice storm that results in a power outage. Peanut butter is a staple, but that doesn’t mean that I want to have to pull that out of the cupboard for supper–that’s snack food or for breakfast on toast, or with slices of apple or stuffed into celery ribs. Dry pasta is a great base for improvising, so it’s good to have several different shapes around to harmonize with what is going in it or on it. 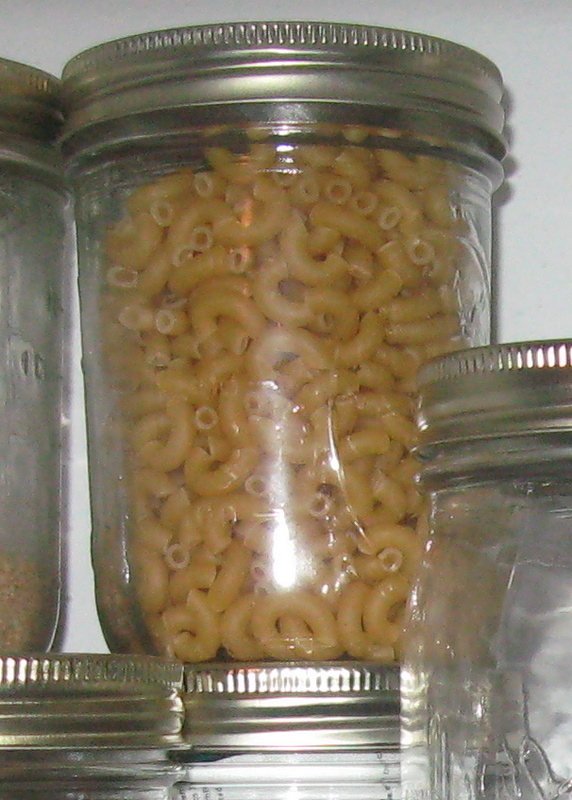 Once the package is opened, if the unused portion is transferred to a Ball or Kerr Mason jars so that it’s tightly sealed it will keep until the next time I need this particular pasta. It will be good to add that back into my meal (in moderation, of course). Dried lentils are another pantry staple–they don’t need soaking before cooking; it’s so easy to make a side dish or a soup using them. There are many kinds of lentils (as there are beans) that can easily add variety to your cooking and allow improvisation. 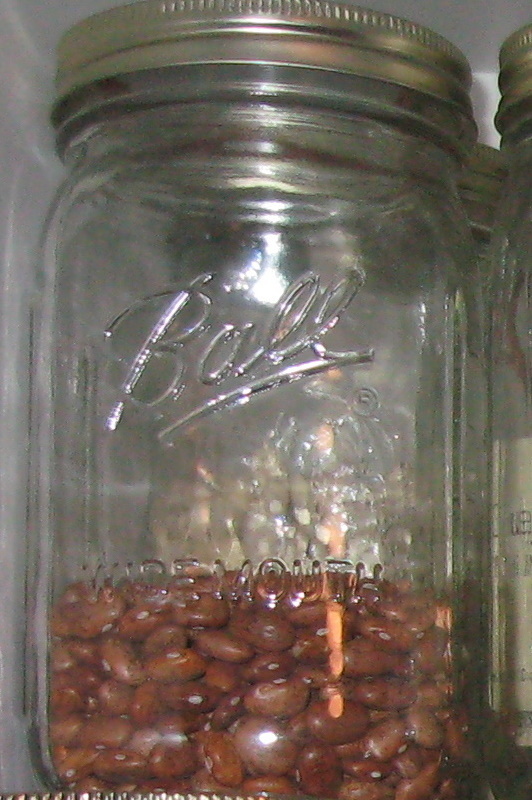 The basic “brown” lentil can be found in most supermarkets in the section with the dried beans and rice. My favorite is the French Le Puy lentil which are small and hold their shape well when cooked. 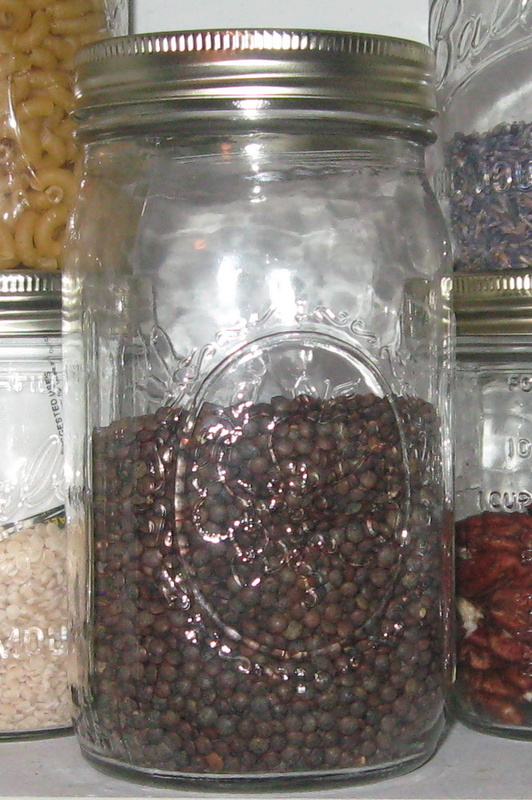 If you use them often, it’s worth looking for other lentils such as small black, or Spanish brown lentils. You might have to find a “gourmet” store, but these are worth having on hand as a pantry staple. Lentils combine well with rice or other grains, and can be cooked with rice, or alone, in the rice cooker. Grains are another staple in my pantry: rice, barley, quinoa, and some of the commercially available mixes that provide variety in a convenient way. Being able to add some of these in Phase 2 is so welcome! Since I love polenta, but corn is off limits, I’m going to try the millet “polenta”, though I don’t expect it to replace the real thing. Basmati rice (brown or white) is a favorite for long-grain rice. Since risotto is a great way to improvise a meal, arborio or another short-grain rice that is suitable for making risotto is on hand too. It’s good to use in soups as well. Barley is also a grain that to have on hand at all times–it makes a hearty soup, it can be cooked like risotto, and it makes wonderful side dish instead of rice. 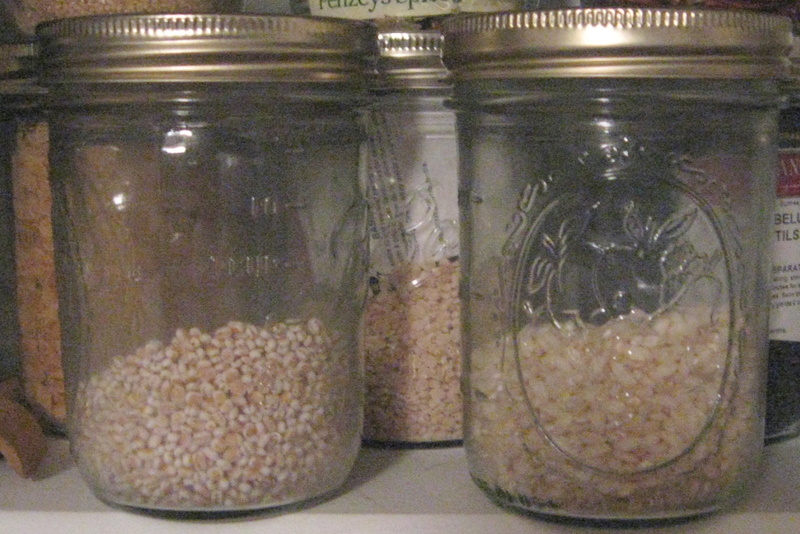 Depending on the season, bulgur and couscous, both the fine and the Israeli, are also likely found lurking on my pantry shelves. Especially in the summer, with tomatoes abundant, tabbouleh is quick, healthy, and easy as a salad or a side dish. There are so many good grains that we use all too infrequently, just waiting to be added to out diet. Though not “dry” cans of broth/stock are good to have on the pantry shelves, right along with the canned beans. As a further backup, something like Better Than Bouillon in whatever flavor you use most often–chicken is a good compromise. Other helpers for improvisation, include good quality canned tuna (personal preference is for oil packed) which can make a salad heartier, or be used with pasta or beans for a main course salad. Sardines make a good meal with crackers or bread and fruit. These are good staples in the emergency food kit (which should also contain a can opener–the manual variety) as well. Salmon is part of the pantry, too, for salad or for salmon cakes. Some other ideas for “pantry” cooking recipes inspired me to add some canned goods to my emergency stash–but that doesn’t include using cream soups and the like for “dump” cooking–that doesn’t particularly appeal to me, but having some carefully selected cans on the shelf can be useful. There are some freezer things that I have found particularly useful while using the Always Hungry? meal plan adapted for single-serving cooking: chopped kale and spinach, chopped onions lend themselves particularly well to getting green veggies into my breakfast. Instead of the formality of making a fritatta with veggies, I find making scrambled eggs with the veggies much easier and quicker. A handful of chopped onions, a handful of frozen chopped greens quickly sautéed before adding the eggs does the job in a way that fits my morning functionality. If there are some cherry tomatoes lurking in the kitchen, those go in as well. Between supplying that quick handful, the opened bags live inside a zipper-lock freezer bag, right back in the freezer for quick access. I find that i use them so frequently that I don’t even do the vacuum seal–just pressing as much air as possible from the freezer bag will do fine since I buy the smaller bags and use them quickly. Now that I can add starchy vegetables in small quantities I’ve found that the Stahlbush Island Farms frozen butternut squash, sweet potatoes, and beets are good to have for use a handful at a time. In anticipation of maintaining the weight loss the I have achieved so far (and hope to achieve in Phase 2) there have been two additions to the pantry–the whey protein, and chickpea flour. In addition to the recipes with the meal plan for waffles/pancakes that use chickpea flour, I’m experimenting with making my own crackers from that, rather than the usual wheat-based ones that I like to have around to go with the pickled herring or cheese. Here’s to maintaining weight loss, eating in a healthier way, and enjoying good food.